Hey, sorry for the long delay! I've been swamped with my side-job writing a book (It's a programming book for nerds, just google for suereth). As far as the tank goes, I'm trying to fund the whole thing from royalties, and I'm still waiting on enough money for real lights. I tried natural sunlight for DSM, but tore that down recently. I now have the 55G sump in the garage with all my plants and fish until I find time to clean up the 125G and start over with lights this time . The unfortunate bit is I have to move everything out of the stand so I can attach my lights (planning to suspend them from conduit attached to the stand). My goal is to finish this book in the next 2 weeks and then hopefully I'll get my next royalty check to pay for some Oddysea lights (cheapest I've found). For those who haven't had a 125G tank before, these suckers are HEAVY! DO *NOT* try to move yourself . My poor brother-in-law must be sick of moving this thing around with me. Hopefully one last time before all is well. The plan, and let me know if you think this is silly, is to use one of those cheap walmart plastic shelving units. Drill holes in the top and run the return lines into it. The first shelve would have little holes drilled throughout and have the filter pad/floss on it. I have the shelving unit, but haven't had time to modify it. I'm a bit concerned about algae in the sump, so I was thinking about (a) putting some RCS in there permanently or (b) getting an SAE or a few Otos and putting in a few terra cotta pots. Thoughts? I'll post pictures of the sump tomorrow. Unless you are planning a planted sump just keep it in the dark and algae won't be a problem. I took a picture of the 55G sump. It's holding some terra cotta pots with all the plants I salvaged, hopefully they'll recover while I wait to order the new lights for the 125G. The fish and shrimp I had in my old 10G are now in the sump as the 10G got shut down (I'm under a 1-active fish tank in the house rule ). The fish and shrimp seem pretty happy with all the new space for them to play with, and hopefully this will keep the sponge filter cycled. @diademhill - Thanks for the advice. I'm hoping to keep scuds (pre-shrimp that can be edible snacks for larger fish) in the 55g sump. I was thinking of putting some Java Fern or Java Moss down there for them with a small amount of light. Do you think that's necessary or do they just needs dried leaves and hiding places? Ah yes, money - always such a constraint for all these brilliant fish-keeping plans! How did the DSM go? Moving tanks is always fun...never underestimate those things! Even the tiniest amount of water seems to make them SO much heavier too! A sponge filter rated for a 125G tank? Didn't even know they could do that much! Doubtful whether it would actually do what they claim haha. SAE's are really good (if not the best) algae eaters when they are young, but I have found (so have many others) that as they get older they start to slack off - especially once they acquire a taste for commercial foods (mine loves flakes now). The sump is looking good! Good luck with the book by the way and keep the updates coming! I should have grabbed some picks of the tear-down. As you can tell by my sump pics, I do not have a good camera right now, so I tend to forget about photography . My dwarf hairgrass was had some nice thin runners it was sending out. When I pulled it out, I was really happy to see how long the roots were. Where the tank is (to be over the steel I-beam in my house), it only receives concentrated sunlight on one side for any prolonged amount of time. I salvaged the 'core' plants I could. I think I'm going to do DSM when I get the lights. 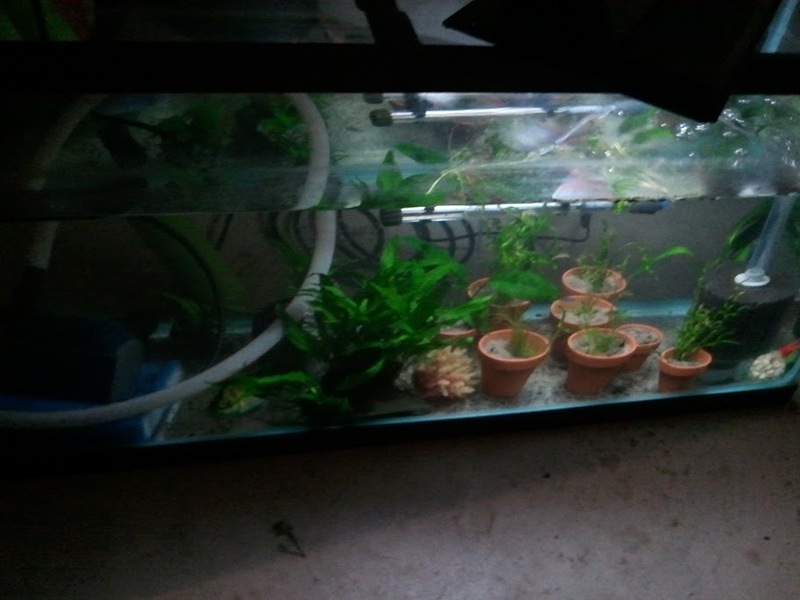 I'm not sure what's going to happen when flooding the aquarium, but the plants grow well DSM. If I can find a good location for it, I'm going to set up my 10G for DSM and try to farm out my hairgrass so I won't have to do so much of that after I get the lights. Another thing: I love organic potting soil now. That stuff is way nicer to deal with than flourite. Were any of the runners from the DHG having shoots making it above the substrate level? Yeah, I've never tried DSM or heard much about it really, but from what I've heard/read/seen it seems to go really well! I think the organic potting soil would work well too! Have you used it much before? Yes, but only a few were visible and *far* more were under the surface. I think if I had been a little more patient, the sunny side of the tank would have done well. I'm pretty excited to get the new lights and try again. Yes, but only a few were visible and *far* more were under the surface. I've noticed that happens a lot - but the fact that some are breaking through is good. Some people think that if the substrate is too large or heavy (gravel compared to sand) the shoots can't make it through to the surface.